Building a log cabin is not complicated, but it is difficult. The work is back-breaking, and the process requires incredible tenacity. If you are doing the work by yourself, the build will take months and possibly years depending on how much free time you have to work on the project. That being said, it is incredibly rewarding to know you took natural materials and made a home from them. 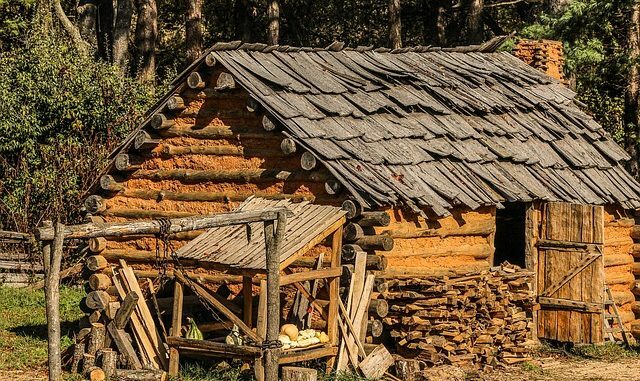 There are dozens of ways to build a log cabin. You can purchase kits, have lumber delivered, and even build a multi-room, multi-level luxury fortress if you like. However, this is not what I think of when I envision building a log cabin. In this article I will cover a simple process to build a small, one room cabin with almost entirely found materials. All you should have to purchase are metal spikes, roofing, windows, and doors. The rest we can find in the woods. Level ground – It is very possible to build a cabin on a hillside, but it is much more difficult and risky. There would be lots of digging involved, and retaining walls may be needed to keep the soil in place. For our purposes, level ground is best. Accessibility – If you plan to drive to and from your cabin, the path to your build site is very important. Be wary of hills that could ice over in the winter or low areas that could flood in the spring. You will also need to get roofing materials, doors, and windows to your build site. Water Source – If you plan to spend any significant amount of time in the cabin, you will want a water source close by. Never build so close to water that flooding or moist soil could be an issue. Springs are best, but a creek or river will do. Water can attract mosquitoes and predators, so I would suggest being at least 100 yards from the source. Soil Quality – No matter how you build your cabin, it will be heavy and will have a tendency to settle over time. You are best to build on a very solid foundation. If you build on flat rocky ground you are okay to start construction. If you build on softer soil, you should bury some posts below the frost line to support the foundation. You should never build on sandy or loose soil. Environmental Concerns – Before you start to build, think about the direction from which the wind will blow. This could affect how drafty your cabin gets. Think about having trees on the south and west side of your cabin but not on the north and east side. This will shade your cabin in the summer, but allow the sun to warm your cabin in the winter. Also be cautious of dying trees that may fall on your structure. If you choose to build near dead trees, drop them before you build. You may also want to consider the view from your location. Proximity to Logs – You may not want to have to transport your logs over a great distance to get to your work site. If you can build near the logs, it makes the process that much easier. Decide how large you want your cabin to be. Remember that the larger it is, the harder it is to keep warm in the winter. For this plan we are assuming it will just be one room. Also, the larger your cabin is the more money you will spend on roofing. Keep all this in mind. What kind of corner notch will you use for your logs? Be sure you have the skill and tools needed for that option. What kind of roofing will you use? You really have three options. You can buy sheets of metal roofing, buy shingles, or cut wood for a shake roof. Building a shake roof by yourself is very time consuming, so this would be my last choice. I like the idea of a metal roof as you can lift large sheets in place and move faster. You may also want to buy sheets of insulation to go under the roofing. Where will your windows and doors be and what size. You will need to order your windows and doors unless you plan to make your own. Will you trim your logs by hand or use a chainsaw mill? I highly suggest either free-handing your cuts with a chainsaw or getting a mill. Using an axe would take much, much longer. Also, if you want planks for floorboards or roof decking you will need a mill. There are three kinds of supplies that you will need for this project. You need tools to get the job done, plenty of trees to cut for your logs, and then an order to purchase items such as your windows, doors, roofing, and spikes. Chances are you will have several months before you need many of these supplies, so shop around and find the best deal possible. If you can haul them to the site yourself, that will cut costs as well. As for tools, you should not need much. A large chainsaw with a mill, a sledge hammer, and a draw knife to peel the logs should be about all that you need. Of course you will need a hammer and nails when you get to the roofing, windows, doors, and flooring. Type of Tree – Not all trees are good for building a cabin. It has to be resistant to rot, resistant to insects, lightweight, straight, and strong. Most evergreens fit the bill including pine, spruce, juniper, and cypress. You also see some people use oak or aspen for log homes, but they are not nearly as common. Size of Logs – If you are building this by yourself, you have to decide how much weight you can carry, drag, load, and set by yourself. This may also help determine the size of your cabin since you do not want gaps or joints in the wall where two logs meet. Remember that the logs will be slightly smaller and lighter once the bark is stripped off. Proximity to Site – When you find trees ideal for your cabin, you will have to transport them to your site. You can bundle them and drag them by truck or horse. However, if you are within a few hundred yards you can probably save time by carrying them. Terrain for Transport – If your logs are on a hillside, it could make for a very difficult trip. You are better to pick trees that are on flat ground so they can be moved easily. How to Peel – You need to have a site set up for peeling logs. This will likely be a set of saw horses to raise the log so you are peeling at waist height. It will give you more leverage and put less strain on your back. Continue this process to roof level. You will need to use leverage to get your logs high enough. Put one end on the structure and then lift and slide the other to get to a pivot point. Then you can move it wherever you need to. If desired, lay slabs of wood for flooring and nail in place. There are some additional steps you can take to make sure your cabin works out well. Stuff every crack and space with dry moss. The more you cut down on drafts, the warmer your cabin will be. You can seal the outside of the cabin to further prevent decay. It can add some cost, but can also add several years to the life of your cabin. Use tar paper under your roofing. This can further protect your roof from leaking. Make the pitch of your roof steeper. This will shed snow and rain much better than a shallow roof. Add a chimney. You can funnel the heat and smoke through a pipe making your cabin warmer and more smoke free. What you can count on is that any cabin you build with your own two hands will be more rewarding than any other home you have lived within. However, I cannot express enough how much more labor intensive this project will be versus your expectations. It will be worth the effort once the project is finished. Take the time build it properly, and your finished product will bring you satisfaction for decades. Any home you take the time, sweat, and blood to build should make a MAN OR WOMAN feel great. and there is always a way to solve a problem when building a cabin, like this sometimes a block and tackle will save your back in moving logs. Ryan, some of the info is beneficial to people with no wood working or building experience. I built log cabins for a living some years back and it’s more work than most folks can do with no experience. It sounds like you looked up most of this material and haven’t really built a log cabin. Not trying to be judgemental, but this should be a last resort as in teotwawki situation or someone with lots of money and time on hand. If it was easy to do there would be log cabins everywhere, Lol. Think hard before taking on projects of this size,it’s hard ,time consuming and can be danerdanedangerous, I’m not trying to discourage anyone but just giving a word of knowledge from someone who has done this. To all capable, GOOD LUCK AND GOD BLESS YOU ALL, AND MERRY CHRISTMAS. Len McDougall wrote a book on building a cabin in the Michagan woods sometime ago. It is worth reading. Maybe a shed is more practical. Jess time and effort. Think water ,heat power .nice views are nice ,except if your part of someone’s else’s view lay LOW ,stock it now .dig a septic. Practice coming and going. That is plan B. Now for plan C. Tell me where it is!